Some people feel Disney and Pixar can never go wrong whenever they collaborate on one these animated movie projects they treat us too every few years. Most of them become instant classics, like “WALL-E,” the “Toy Story Trilogy,” “Up,” and “The Incredibles.” And if you are thinking their magic may be winding down because you may have heard somewhere that “Cars 2” flopped in the box office, then think again. The film made almost $560 million worldwide. “Brave” is set in ancient Scotland, where Merida (Kelly Macdonald) is the not-so-fair princess in a kingdom ruled by her father, King Fergus, (Billy Connolly) and her mother, Queen Elinor (Emma Thompson). An atypical princess who would prefer to practice her archery over being dainty, Merida challenges tradition and ancient customs one day and inadvertently unleashes chaos on the kingdom. The lords of the land are less than pleased and cause an uproar when they find out. In order to right her wrongs and bring peace back to her homeland, Merida seeks out an eccentric old Witch (Julie Walters) for help, but must discover the true meaning of bravery and leadership to undue a beastly curse before it is too late. In the embedded clip below, we see King Fergus (Billy Connolly) sitting at the dinner table telling his family one of his old battle stories – for what appears to be the umpteenth time – and abruptly gets interrupted by his daughter, Merida (Kelly Macdonald). It’s a pretty straight-forward scene, and not to spoilerish either. But it is a small example of the commitment to detail this movie is aiming for. The art is spectacular, with beautiful colors and every strand of hair in the characters head, to the dust in the tables being exquisitely rendered. And in the second clip, King Fergus and Queen Elinor discuss how to deal with their daughter. 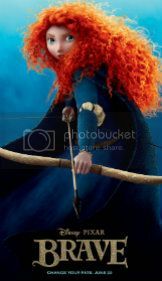 “Brave” will soar into theaters on June 22. It stars Kelly Macdonald, Billy Connolly, Emma Thompson, Julie Walters, Kevin McKidd, Craig Ferguson, Robbie Coltrane and was directed Mark Andrews (screenplay writer for “John Carter”).